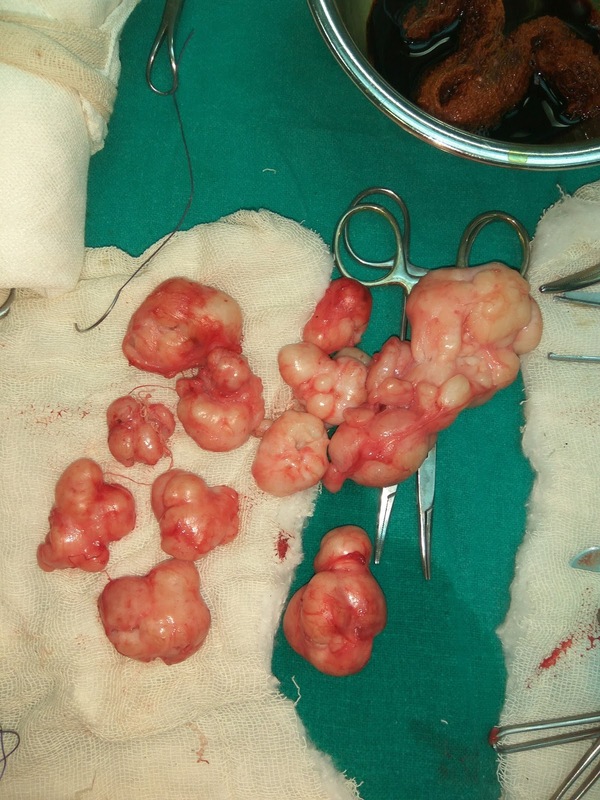 A 32 year old female came with multiple lumps in her right breast which have been there from past 7 years and are increasing in size and number. Initially she was advised conservative management and observation. But the lesions were growing in size and she had started having occasional pain. So she decided to go for surgical removal. Discussion: What is the best incision if multiple fibroadenomas have been identified? Having multiple fibroadenomas in a single breast is a rare occurrence. Each of these having their advantages and disadvantages. Utilising the mobility of the fibroadenomas, allows them to be excised through a single cosmetic circumareolar incision in each breast. Periareolar incision is not suitable when the diameter of the tumor is >5 cm or when the distance between the tumor and the areola is >3–4 cm, since the surgery would cause significant damage to the lactiferous ducts (Zhao XY). Traditional surgical incision often chooses radial incision or curvilinear incision on the surface of the tumor. It is very favorable for the exposure and resection of the tumor, and the treatment effect is also good, but the postoperative scar is obvious and affects the cosmesis.